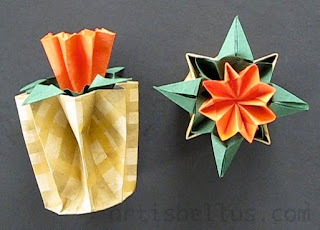 This Kusudama Flower and Pot model is a very fun fold. 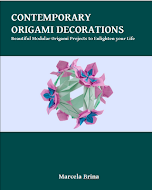 It is made assembling three kusudama flowers (traditional model), two of them with small variations. This is a very simple idea. I will not be surprised if it already has occurred to someone else before me. one 6" (150 mm) square sheet of scrapbook paper, for the pot. one 4" (100 mm) square of green kami, same color on both sides, for the leaves. one 4" (100 mm) square of orange washi, same color on both sides, for the flower. The kusudama flower on the top can be replaced by other flowers, like a traditional lily. Which other flowers do you think will best complement the pot? Nice idea, great result with simple figures. 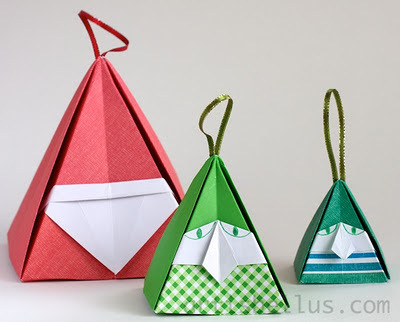 Wonderful idea for an excellent exercise of origami as group activity.Thanks!